Shocker: Solar panel manufacturing creates potent GHG's | Watts Up With That? My 100KW solar panel project at a local school when I was a trustee - all for nothing now? On Lubos Motls The Reference Frame he has as pointed out that a greenhouse gas emitted during the production of solar panels and HDTVs, nitrogen trifluoride (NF3) that is used for cleaning the electronics, is about 17,000 times more potent a greenhouse gas than carbon dioxide. The concentration of NF3 in the atmosphere was artificially increased by a factor of 20 during the last two decades. The measurements of the concentration surpassed the previous estimates by a factor of five. According to the Scripps Institute; ” the present 5,400 tons in the atmosphere…is on the rise at 11 percent per year” – that will stay there for 700+ years – creates the equivalent warming of all Finland’s CO2 emissions. According to Lubos, given the fact that the solar panels produce about the same percentage of the global energy as Finland, it is reasonable to guess that the state-of-the-art solar panels that would replace fossil fuels would cause a comparable amount of warming per Joule as fossil fuels. So let’s just say – everything causes global warming, and leave it at that. The concept of the global warming potential (GWP) was developed to compare the ability of each greenhouse gas to trap heat in the atmosphere relative to another gas. In this case, CO2 is the reference gas. Methane, for example, has a GWP of 23 over a 100-year period. This means that on a kilogram for kilogram basis, methane is 23 times more potent than CO2 over a 100-year period. October 27, 2008 in Uncategorized. I have a question, that I have yet to find an answer for. What is the GWP for water vapor? Every time I see a list, it is omitted. I should be on this list I think. Sorry, it should say “It should be on this list I think”. The power utilities are trying to keep a low profile on SF6. This wondrous gas is a fantastic dielectric insulating material, as well as an excellent arc quencher in high voltage circuit breakers. It is found in tens of thousands of HV circuit breakers all over the world, as well as HV potential transformers and gas-insulated buswork. Some of the smallest HV substations in the world are completely insulated with SF6. When people started to realize SF6 was a greenhouse gas extraordinaire around 1995, some producers backed out of the business of selling SF6, resulting in a run-up in price by a factor of ten in a few years. Ummm … isn’t that OK since they are offset by being in the green business? Ya know, like Al with his house and his jet and his Carbon Credit business? The processes that use these chemicals produce more than just solar cells. I would guess that LCD displays and HDTVs far exceeds the production of solar cells. Assuming we can double the solar cell capacity in less than 7 years (which would see a doubling of the gases at 11% growth), there will be a net savings in the warming potential. Assuming that solar cells account for no more than half of the total emissions, this could be a significant savings. Solar cells offer the potential of reduced greenhouse emissions, but the issue of storing the energy produced for use when the sun is not out and the pollution involved in manufacturing that storage capacity is really the bigger issue. Can anyone explain to me how NF3 can be 17,000 times more potent as a greenhouse gas than CO2? Oh yah, now I get it. Since the effect of CO2 is so infinitesimally small, 17,000 X nothing is still nothing. I still have the same T.V. I bought 20 year ago, does that make me NF3 neutral? I guess we are going to have to set-up an NF3 offset trading scheme. Everything we do involves risk/gain. In our modern society, this is often viewed as cost/benefit. This post is an example of how we trade one by-product (CO2) for another (NF3). In this case, I imagine that this is a poor trade-off in that NF3 resides in the atmosphere far longer than CO2. In my case, I’ve made a trade-off in replacing high usage incandescent light bulbs with CFLs, knowing as I do that they contain trace mercury. In any case, the problem I have with so called alternative energy is that the cost is understated due to government (taxpayer) subsidies. Would anyone willingly adopt windmills or solar panels if they had to pay the entire costs themselves? I have my doubts. Only until alternative energy can beat other energy sources on a real cost/benefit basis will they become viable. Yeah, and if this stuff keeps growing at the Present Rate it’ll be up to One Part per TRILLION in 50 Years. Wow ,i didn’t know that they emit that much CO2.Something should be done. OK… That does it then, we must return to the stone age. Except no fires. I wonder why solar cells were left unmentioned in this news article. Looks like if we get rid of Finland we can keep using this stuff. I was worried until I saw “… creates the equivalent warming of all Finland’s CO2 emissions.” To me it just sounds like “… an area the size of Rhode Island.” I guess this is why the big push for thin-films like CdTe, oh wait, cadmium. I just read a story about revisiting nuclear powered aircraft. I think I’ll stick to good ol’ natural oil – straight from the ground as nature intended. Solar cells are also left off of this July 2008 article from the Guardian. Oh, answered my own question there didn’t I. The green movement desire us all to sit around candles, but candles are composed of either palm oil, paraffin, or petroleum wax. Can one not see some objections by the greens to using these materials? So when we return to the natural state, what can we use for light and heat that does not use these products. It is no use gathering up brushwood , or cutting peat for a fire, as Nature has a use for this that does not include warming us! Dihydrogen Oxide (H2O) is a 4. Neither water molecules nor CO2 absorb near the maximum of the infrared radiation emitted from ground or from water at ambient temperatures. They leave open the so-called atmospheric window. Methane and other molecules absorb in the ‘atmospheric window’ thus reducing strongly the radiative heat transport into space, at clear skies. (Water droplets do absorb strongly at all relevant infrared wavelengths). If such molecules have a long life in the atmosphere, they accumulate very much. CO2 has a lifespan of 50 years, methane of 10 years, N2O probably much shorter, some weeks, I guess, but all fluorines are very stable molecules and stay in the atmosphere for a very long time. This is great news! CO2 is off the hook then. All it needs now is for some “scientists” to find that windpower develops some other kind of CHG that’s x 100 more powerful than CO2 & the circle is complete. Twice a very small number is a very small number! Perhaps the penny is dropping, everything pollutes, whatever we do, so let’s chose & use the lesser of evils & use fossil fuels while they are still here instead of pursuing silly political ideals that seem to ignore the poor & starving, for some peculiar reason! I’ll be looking for the share price to plummet on photovoltaic cell manufacture. *laughing* I like it, I do! the manufacturing of ‘green’ electricity generation products causes the emission of, to date, the most powerful greenhouse gas that I have ever heard of. If that’s not poetic justice, I can’t say what is. I think, the NF3 emissions are much worse. As NF3 remains in the atmosphere for approx. 700 years, while a solar cell produces electricity for only approx. 30 years, the net greenhouse emission of solar cells in the long run should be approx. 20 times higher than those of replaced fossil fuel. Add this to the fact that ethanol creates more CO2 than burning just plain gasoline, and we have solutions at hand … Don’t we? Well, maybe not, do we know how much CO2 it takes to make those giant windmills? Probably would have been better to put in some ceiling windows and let those poor students get some natural light. I think the reference to Finland make some sense. The point is that the global energy production from solar cells is in the same order of magnitude as the (CO2) output from Finland. Hence the net greenhouse contribution from solar cells is currently nil. Why am I thinking of that illustration of animals caught in a tar pit? Guys you’re making a mountain out of a molehill. The concentration of NF3 in the atmosphere is 0.16 parts per trillion! Even with the 17,200 greater strength, its the equivalent of less that 0.003 parts per million of CO2. I don’t know why you guys are worried about costs all the time. Surely the bailouts have shown that governments have oodles of money under their mattresses ready to fund absolutely anything – even bad debts. Or are they just lying to us again and the money isn’t really there? At any rate though 10 billion for a nuclear fusion project looks like mere small change now. Imagine that 700 billion (seemingly conjured up in the blink of an eye) directed towards energy and infrastructure projects instead of bailing out and rewarding greedy, stupid bankers. Even better, imagine that those middle east wars were really about protecting the oil supply rather than fighting terrorism and then add that total cost to the pile of money that has been flushed down the toilet when it could have been used for something useful. Not to worry – it will help keep us warm. The concentration of NF3 in the atmosphere was artificially increased by a factor of 20 during the last two decades. There’s a natural source of NF3? paminator talks about SF6. I use that gas as an insulator in the ion accelerator lab I operate. It does have a large GHG index, but what is forgotten is its very high molecular weight and density. You can actually see this transparent gas flow and sink to floor level if you let some leak out of a hose. The density is so much higher than air the index of refraction change is quite apparent. It would take a lot of mixing to keep any SF6 in the upper parts of the atmosphere to provide any IR reflectivity. I suspect most of the SF6 is hanging around our feet. And if you try using solar cells in the Great Plains or Southeast, what are the odds that, during those 30 years, they’ll be damaged during a severe thunderstorm? These can produce some major hail stones. I wince just to think of what a home owner’s insurance rates would look like if they have to include possible damage to solar panels. Is the weighted average of the atmoshperic concentration relavent to GWP? CO2 at 385 PPM and a factor of 1 compared to H20 at a 4 GWP and one percent concentration makes H2O over 100 times more potent on a weighted average basis than CO2. I did the same, but only for my outdoor lighting. I live in a region where I have no air-conditioning bills (not needed) but I do have heating bills. The 85% energy use difference between incadescent lighting and CFLs are heat losses. The heat from my indoor incadescent lighting helps defray my other home heating cost. Think about it. Even green fool-aide drinkers should understand that it is more GHG friendly for me to utilize the power company generated heat from my lightbulbs than for me to use my home furnace which is less thermally efficient and therefore generates more GHGs per thermal unit. But, I am being to logical. Your shivering in the dark this winter is POINTLESS. You are not “saving the planet,” preventing sea-level rise, stabilizing the climate or helping polar bears. You are just shivering in the dark. It’s also enough to significantly affect the speed of sound through the gas. It’s the “anti-helium.” You can find videos on YouTube of people goofing around with SF6, giving themselves deep voices. D. Quist (@19:10:40): The reason that water vapor is not on a “GWP” list is that an emission of a kg of H2O would mostly condense out in a fairly short time, and that time would be very dependent on conditions (relative humidity, for example). So if you take the integral of radiative forcing over 100 years, the GWP of H2O would be very small, and also poorly defined. This is different question than what the contribution of water vapor is to total radiative forcing in the atmosphere: there, H2O (including clouds) is about 70% of all radiative forcing, compared to CO2 which is about 20% (plus or minus a bunch depending on how you do the calculations). Which is a different question still from what the human contribution is: CO2 we can measure fairly easily. Despite massive water budget changes through things like creation of giant lakes (Lake Powell) and huge irrigation programs, we probably don’t have much direct impact on atmospheric water vapor (again, because it condenses out). The indirect impact on water vapor (and clouds) through the change in atmospheric temperature due to increased GHGs is the elephant in the room on this question, and probably where more than half of the legitimate uncertainties in climate change predictions come from. As stated (but somehow “forgotten”) in the original paper, NF3 contribution rightnow is approx 0.04 percent of the anthropogenic CO2-induced contribution to the greenhouse effect. This means that the present-day concentrations of NF3 should be multiplied by at least a factor of 10 before becoming comparable to CO2 effects. On the NF3 from solar panel questions: Lubos makes at least two significant errors in trying to say that NF3 from solar cells is the same magnitude greenhouse effect as CO2 reductions from solar cells. 1) As mentioned in an above comment, solar cell manufacture is far from being the only source of NF3. 2) He is equating the total atmospheric stock of NF3 (eg, 20 years worth of emissions) with the solar cell energy production in one year. Now, it would be useful to do a proper lifecycle analysis: how much CO2 is emitted in solar cell production, maintenance, and disposal, what kind of energy are solar cells displacing and what was the CO2 emissions from that, and what are the NF3 emissions. My gut instinct is that solar cells are still a net-plus for the climate. Obviously the NF3 reduces the size of that net plus compared to the counterfactual with no NF3 emissions, but I’m guessing it will be on the order of a few percent reduction, not 100% reduction. I suspect most of the SF6 is hanging around our feet. I was wondering why my feet have been warmer lately. Mike Monce- I also have worked with SF6 in the lab, and I agree that you can see the refraction of the gas as it vents out of an open port. I have not seen any reports on SF6 concentrations versus altitude in the troposphere or stratosphere, and I would bet that it is inconsequential. My point was that very useful chemicals are being banned or penalized for no good reason. Werner Weber- CO2 has an atmospheric half-life of 3 to 7 years, demonstrated by ten’s of peer-reviewed studies dating back to the early 1960’s. Any numbers higher than this range (your 50 year number or the IPCC’s 100+ year number, for example) make assumptions about carbon cycles and carbon sequestration, which is nonsensical. Anthony- Do you have the costs and performance data for that beautiful solar PV installation? It would be interesting to see how the payback is working out, including any maintenance costs associated with the operating system. Has anyone seen a study on increased UHI effect (and subsequent impacts on NASA GISS ‘data’) due to the reduced albedo caused by a solar panel being installed over a higher-albedo surface such as gravel, crushed shell or a rooftop? This would probably dwarf the effects of 0.16 ppt of NF3. No, back then it was cleaned with TriChloroEthane or Freon which caused a hole in the ozone! Now we find out from our brilliant scientists that Freon’s ability to bond with ozone is 1/10th what they thought it was. Odd, my gut instinct is that they make no difference whatsoever. It doesn’t matter what we put into the atmosphere, it’s cooling anyhow. All molecules are not created equal. But for the Global WarmAl Worshipers, they are all greenhouse gases regardless of their origin and concentration. 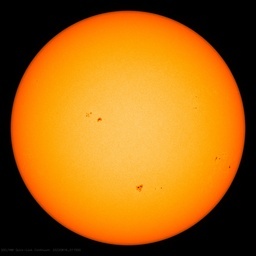 The Sun of Man doesn’t care which molecule is what and where, it will keep going through its natural cycles of solar activity as it always did. The NF3 is easy to deal with. Filters could capture it in the process or it could be rapidly replaced with an alternative. Have they ever tried soap and water? I’d like to go on record as offering the first NF3-offset. Go ahead, buy you solar panel and HDTV, just send me $100 as an indulg….I mean, NF3 offset. Pretty much like carbon-offsets, I won’t do much of anything with the money, but you’ll feel better. Right? You see, if people would only honour the Precautionary Principle, nasty surprises like this would never, ever, ever occur. OK, so we replaced CFC-14 (or similar) with NF3 for cleaning electronics. What is the GHG number for Freon? Oh, I forgot, we saved the Ozone that Freon wasn’t really destroying. How much does NF3 cost? Looks like we didn’t gain much. I doubt solar panels will produce anything near full output for 30 years, even without hail stones. The cover glass darkens, the material degrades. When I could still climb minor mountains, I found solar panels at monitoring stations along the way totally trashed by forces of nature. Where does the 17,000 come from? I find it hard to believe that NF3 could absorb 17k as much light, would have to be darker than coal dust. Using incandescent lights to heat your house only makes sense if you have expensive whole house heat. Electric heat costs 3-5 times as much as gas. If you do it on a local basis, the reading lamp next to your chair, a little better, but a 100 watt bulb isn’t going to take much chill out of the air. I just wear a hat. Lol. 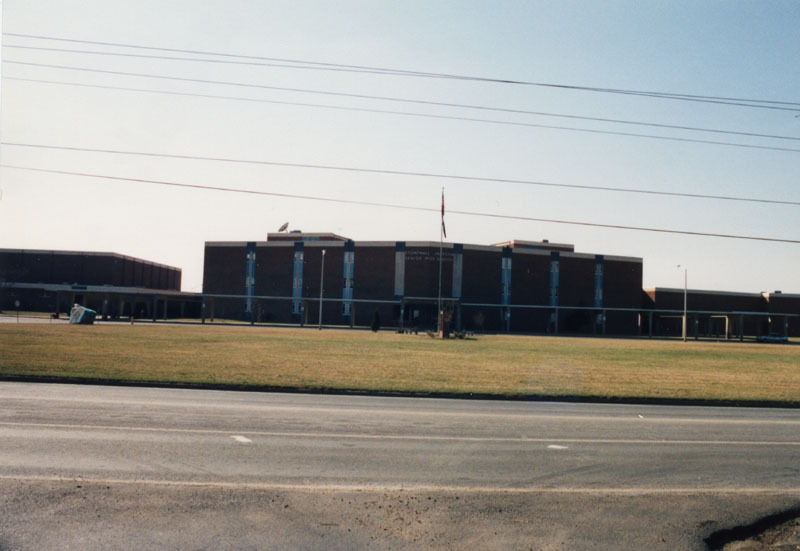 The High School I went to looked like a fortress, literally. No large windows, only narrow, arrow-slit type windows, and then in only some of the classrooms. Three stories, large and imposing facade. The interior was large and open, except for science classrooms. I guess in case some chemistry experiment went wrong. And the amount of energy produced by the cell will gradually decline over that time. You are neglecting the losses in electrical conversion and transportation. Most modern heaters get efficiencies in the 80 to 90%. I’ve never heard of an electrical generator that has efficiencies that high. My gut says that they are a net minus. And since my gut is bigger than either of yours, mine wins. If people properly followed the Precautionary Principle, nothing would happen. Period. By definition, an electrical heater is 100% efficient. It is a resistance that transforms all the electricity into heat. The electricity transport and the rest of the house’s thermal insulation is never used in the calculation of the efficiency of the heating device. This non-scientist doubts that NF3 will persist in the atmosphere for 700 years. Is there any experimental research that supports this contention. It seems counter-intuitive. What is the proof? As I recall experimental research indicates that CO2 lasts in the atmosphere for 5-12 years. Modelers assume that it lasts 100 years. Which is correct? What is the proof? So water is 4x more potent than CO2? When I looked at Wiki (yes I know it is a four letter word), it pointed out that water vapor is not calculated because it depends on concentration and temperature. I know we are all waiting for Aqua on that one. So, in conclusion in a stable gas, with a known amount of water and temperature, H20 might be 4x stronger than CO2? I am not sure if I am convinced. Table 4a. helped with the overall effect for sure. You make a fair observation and reminds me why Anthony runs such a great site. CO2 is a greenhouse gas, but we don’t know its true effect on water vapor. However, there is always wapor in the air, and I just find it incomplete when water is not listed with its ranking compared to other gases. Again thanks everyone. I am a little smarter and wiser thanks to you. It might be true that water has a short life-fly time in the atmosphere but when it “drops” down it is still water, so technically the lifetime of water is very very long!!! Moreover, when liquid water absorbs the heat in the atmosphere it will bring down that heat to the ground & ocean, so in fact, removing that heat from the atmosphere only to be radiated slowly back to the atmosphere. Condensation is another business where the heat is actually returned, in part, to the atmosphere. The case of CO2 is way different. For CO2 to be removed from the atmosphere, it has to react. There are lots of different paths that CO2 can take to be removed. But contrairely to water condensing, the CO2 will transfer the extra little thermal energy to the reaction, most likely on the ground, vegetation or ocean. That is a little wrong. There are other people here that can explain this much better, but I’ll like to take a stab at it. Water on the surface absorbs heat and evaporates. Being warmer than the surrounding air it rises. At altitute it looses the heat and condenses, falling to the ground as rain, that is colder than the initial vapor. This occurres because at altitute there is less atmosphere above the vapor so the heat in the vapor, continuosly radiating in all directions, looses more heat into space, than is reflected back by the atmosphere above it. This is a negative feedback. Now, this is not always true. If there is not enough vapor to form rain drops, we get thin high level clouds. They form a cover that will reflect heat downwards. That would be positive feedback. The big question, is how much rain versus high level clouds. The Aqua satellite might know. P.S. Please don’t trash me too badly. I am aware that this is a grade school answer. According to the all knowing Wiki, Finland is ranked 48th in CO2 emissions producing 0.2% of the worlds CO2 “pollution”. Rhode Island is the smallest of 50 states with only 0.04% of the the land. I guess it would actually be closer to Connecticut or New Jersey. Didn’t mean to offend the Fins. I’m not sure how they affect the UHI, but PV panels typically operate at 30-40 deg C above ambient at full sun. They will keep a dark roof cool, but a white roof will do more for keeping your house (and probably the planet) cool. Of course I did not give the whole picture as to the different phase changes of water. But in your simplified senario, you have a net zero effect. The extra heat I was talking about was that of the infrared absorption from the sun. It is clear that both ground radiated and sun infra red radiations will be abdsorbed by the water molecules. As well, I was also talking specifically about liquid water droplets in suspension in the air. The water molecules don’t rise up from the ground to the upper atmosphere because they are warmer, the zeroth law of thermodynamics applies here. The rise due to diffusion and to some other extend to a concentration gradient. But back to the real life time of molecules… what’s the probability that a water molecule falling on the ground will take flight again back to atmosphere? We could put a fairly high probability since most of them will be on a surface and those fallying on a body of water will not sink at the bottom but pretty much stay at the surface and take flight again (at least for the majority). This is absolutely not the case for CO2. Once it is absorbed, a very small fraction might take flight again. Most are chemically absorbed and chemically created. “Every time it rains it rains – carbon sequestration. My attempt to turn this into pennies from heaven by pointing out that I live in damp, soggy, Southern England, (where as I look out of my window it’s currently falling as sleet), and the rain that falls on my land should be saleable as carbon credits have not so far met with success. Werner Weber- CO2 has an atmospheric half-life of 3 to 7 years, demonstrated by ten’s of peer-reviewed studies dating back to the early 1960’s. Any numbers higher than this range (your 50 year number or the IPCC’s 100+ year number, for example) make assumptions about carbon cycles and carbon sequestration, which is nonsensical. . . . I assumed that the time CO2 hung around was calculated by taking the annual flux and dividing that into the total supply. That got me around 57 years, depending on how you figured the flux on the rising CO2 curve. Is there some other method? RE Paminator up there a ways: on CO2 half life. I’m with you Paminator on the absurdity of the claimed 200 year “residence time” for man made CO2. The Mauna Loa CO2 data shows a 6ppm p-p annual cycle, and if you look at that “triangular” waveform, you sill see that it goes down in five months, and up in seven months; and if you look at the raw data closely, you will see that it is not quite triangular, but is a single time constant integrated square wave with a 7:5 duty cycle. Of course the first chap at ML who saw that data, did an immediate reduction to compute the integration time constant of that effect; yeah fat chance trying to find that time constant anywhere on NOAA. The other thing you can’t find on NOAA any more is that 10 or so year global pole to pole three dimensional plot of the CO2 data. When you could find it, it shows that at the north pole, that 6 ppm amplitude has grown to 18 ppm (confirmed to me, by Dr Steve Piper at Scripps (CO2 guru)). So the growth cycle can remove 18 ppm of CO2 from the polar atmosphere (north) in just five months. My eye guesses that the time constant can’t be any more than 3-4 years tops. A couple of rednecks ata bar were goofing around, and they spied the young black laborer quietly downing his beer at the other end of the bar, and decided to hassle him. So how do the atmosphere know to only hang on to man made CO2 for 200 years ? There’s a bright young black laborer still wondering on that . I think his position is quite clear. He is, by the way, an expert reviewer for some of the IPCC reports. Click on ESEF Volume 2 to download the pdf file. Lots of information about CO2. If we are going to use CO2 atmospheric lifetimes of more than 5-7 years, then we also must use water vapor lifetimes of more than a few days. You eventually can sequester water in the form of ice or permafrost underground, but I would guess the ‘IPCC’ lifetime of water vapor in the atmosphere is also many years. What a stupid game this is. Where is that school? 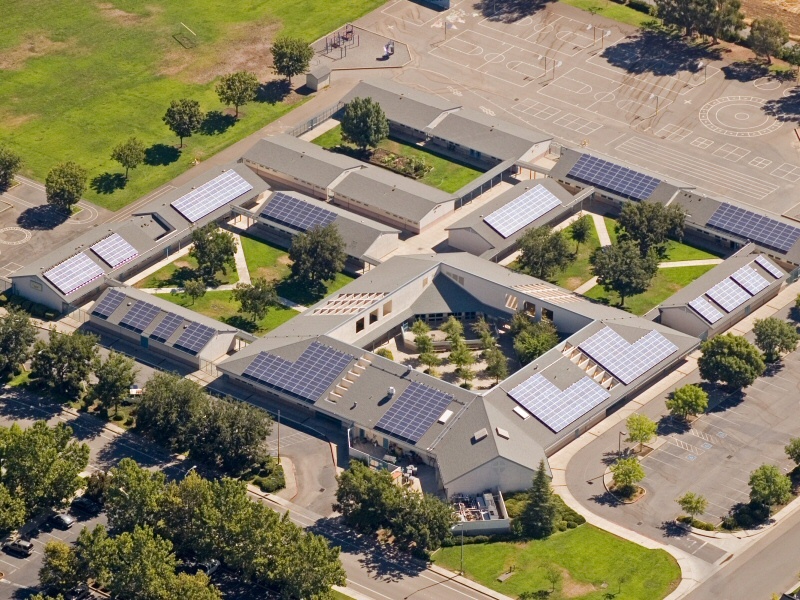 I really like the architecture (even “evil” solar cells)! I think you are still mixing things up a bit. Water vapor rises through the atmosphere due to thermal convection, not through “diffusion and to some other extend to a concentration gradient” as you propose. If it is vigorous you get cumulus clouds reaching tens of thousands of feet into the air. At the top of the cloud heat is radiated into space. These clouds reflect a substantial part of the solar energy back into space at the same time due to its high albedo. The result is that water in this case is a cooling agent, with a negative temperature feedback. This energy conveyor is very active around all of the tropics where most of the solar energy reaches earth. CO2 simply increase the pace of this. As for CO2 balance, one can argue that the oceans absorbes more when it cools, and releases it when it warms. If we have a warm year, we get more biomass that will absorb CO2. However, neither process removes CO2 permanently. Biomass decays, releasing CO2, oceans warm up releasing CO2. This changes with seasons and with short term climate change. The only permanent removal of CO2 occure when it is disolved in water, and and as a weak acid reacts to exposed rock and other materials. Only then is there a permanent removal of CO2. I forget, certain sealife use CO2 for their shells. As they die most of it falls to the bottom and is removed from circulation. Therein lies the flaw in your thinking. You have to examine to total energy production path if you want to know the over all efficiency of your system. By ignoring much of this path, you may get the answer you want, but you will never get the right answer. I use almost 100% solar energy for heating. Wood. I burn wood for heat. Thereby releasing the imprisoned CO2 from older trees and allowing it to be reused by young trees to spur their growth. Which will eventually be cut down for fire wood, completing the cycle. However, I don’t burn wood to keep my carbon footprint small. It is strictly economic. I have acres of trees and other than the labor and fuel to cut them down, I have basically ‘free’ heat. I pay local people to do the cutting, so I also stimulate the local economy at the same time. My electric supply utility offers me the option of buying wind power (I am already mostly hydro-electric), but oddly they want me to pay MORE for this ‘free’ alternative energy (which is already getting a huge subsidy from the taxpayers). We should not be to worried about the “power” of greenhouse gases. Most of them are relative heavy and they will not reach the upper levels of our atmosphere. There will be sufficient measures taken to contain gases released during manufacturing and recycling. Other manufacturing technologies of solar panels (or units) do not have or will not have these problems. Have a little trust in the future. I am convinced that technology and common sense will overcome all the problems. I am also convinced that solar will have a very big future. Eventually it will make us completely independent from oil and nuclear. It will also make us independant from the centrelised energy producers which I ragard as a kind of freedom. It takes about 16 square meters of solar panels to produce the energy to make a car run 20.000 km/year. Batteries and ultra capacitors are to become more powerful and light weight every day and prices will become compatible as soon as mass manufacturing takes off. For heavy transport, trains and ships we can use hydrogen electric. I am absolutely not a green loony but I am convinced that we eventual need an alternative for oil. Oil is to precious to burn as a fuel. Solar will do the job perfectly and as cheap as coal. I also believe carbon dioxide emissions is a non existing problem and therefore I reject any sales argument of products limiting greenhouse gases. It’s the biggest scam on earth and we should fight it. We should especially reject the government regulations and the caps & trade schemes that will only harm our economies and our personal liberties. Well, internal combustionm engines produce CO2 as they go. In contrast, NF3 is only used during manufacturing process of solar panels, and only a small amount of it escapes into the atmosphere. Sure, “17,000 times more potent a greenhouse gas than carbon dioxide” sounds scary all right, and “twenty-fold increase in 20 years” even more so. But come on, amount of NF3 in the atmosphere during pre-industrial times was approximately zero (although apparently we can measure it using some super-sensitive equipment), and twenty times zero ain’t that much. By the way, NF3 is used to make most of the modern electronics, and using it for making solar panels at least reduces the need for oil and CO2 emmisions. Manufacturing of mobiles phones and computer chips also used NF3, but does not reduce CO2 emmisions, so here you go. How on Earth are they measuring parts per trillion of ANYTHING in air? The testing labs I use as an environmental engineer are hesitant to report and result less than the ppm range. They can go to about 50 ppb for a yes/no answer, but that isn’t even accepted by the EPA because the test method isn’t approved yet. I call their procedure into question. Well based on a global mean surface temperature of +15C,t eh surface infra-red radiation would be bounded by a black body radiation spectrum peaked at 10.1 microns. Ozone absorbs in the 9-10 micron range, and CO2 absorbs at somewhere between 14.7 and 15 microns depending on who’se data you can find. But practically due to pressure broadening and Doppler (temperature) broadening, CO2 absorbs from about 13 to about 16.5 microns. or about 13.75 to 16 if you take width at half height. Data from The Infr-Red Handbook shows CO2 and water as affecting the surface emitted radiation from 13 to 18 microns. The ozone peak is right slap on the peak of the emission for much of the globe and seasons. But if you ignore the fictitious global mean temperature, and instead treat the real global surface tem[perature range from tropical desert highs of +60C (surface) to Vostock Antarctic winter night lows of -90C, then you find the suspectral emittance peak ranges from about 8.8 microns out to 15 microns at the coldest temperatures. So in the polar regions the CO2 peak is about right on the surface emission spectrum while at the desert highs, the CO2 effect is quite attenuated due to the Wien displacement of the emission peak. Also in the case of CO2, it is the very ground level CO2 that is important, because that is where the pressure is highest, and the temperature is highest, so as you go up in altitude the CO2 absorption peak narrows around the intrinsic line width. The ozone peak, since it is a high altitude pollutant is a very much sharper absorption dip than CO2. Re-emission from CO2 spreads isotropically, so about half goes up, and half goes down, and the part that goes down is either reabsorbed by CO2 (or water) or hits the surface. the half that goes up, increasingly escapes further CO2 entrapment, sicne the temperature and pressure broadening are dropping, so the absorption line narrows with altitude. Acocrding to NOAA official earth energy budget, the so called atmospheric window only allows about 10% of the surface emitted IR to escape to space, so that is the extent of the total extra greenhouse effect one could expect from more GHGs. And the role of water is way underplayed. Water doesn’t mind evaporating from the ocean surfaces, but once removed from the surface by upward convection or winds; it simply hates to condense, unless there is a surface to condense on. That surface can be a dust particle, or a bacterium, or even a charge ion shower track caused by incoming ionising radiations, so the water vapor gets transported (along with 540 or so calories per gram of latent heat of evaporation) high into the troposphere. Eventually it gets cold enough and finds some method of nucleation to form water droplets (clouds) and thereby dump out its 540 calories per gram of energy, and eventually some oif it will get high enough to form ice crystals, and dump another 80 calories per gram of latent heat. So the water cycle is the most potent energy transport mechanism for getting heat energy back out into space, other than direct electromagnetic radiation. And when ANY sort of cloud moves in front of the sun; it ALWAYS cools down; it never heats up, so clouds of any form are a negative feedback factor. It doesn’t matter that high clouds at night slow the cooling of the surface; that is last night’s weather; but the persistence of such clouds over climate time scales always results in cooling from solar radiation blockage or reflection (albedo). Ron de Haan: 16 square meters can power a car? Midday you might get a bit over 3kw. For the whole day, perhaps 20 kwh. Assuming a wimp motor of just 20 hp (15 kw) and a battery efficiency of 75% energy in to energy out, you might get an hour of driving. Except on overcast days, then you walk or ride a bicycle. Solar has it’s uses, particularly in remote locations or where small amounts of power are needed. Like weather stations, for example. When you consider the whole picture, producing the silicon, and some of the rather nasty chemicals used in poduction, NF3 being rather minor, the cost is a whole lot higher. Thermal solar, reflectors and making something hot, has less environmental downside. It still isn’t cost effective. For a start, there’s that 100 year period; what on earth does that have to do with anything. Does a CO2 molecule gradually lose its “potency”? Man, there’s an image for you ! One poor little old CO2 molecule just sitting there waiting for photons in the 40 to 240 millielectron Volt energy range to come along; well CO2 really only cares about the 75-90 meV range (no not MeV). Why would the molecule care about having to wait 100 years? Just what does time have to do with GHG molecular spectroscopy ? Then there’s that Kilogram thing; that old slab of platinum. Everybody quickly; what are the molecular weights of H2O, CO2, NF3, and SF6; and how many of each do you get for your kilogram; don’t GHG modellers understand about the periodic table and the concept of molecules. So who out there has a preferred value for the NF3 capture crossection for 40-240 meV photons. We moved all of our silicon fab foundry stuff out of the building, so I am still trying to find a fab engineer to find out what they used to use NF3 for; my guess is it is used in plasma etching processes. Certainly if it is so stable, it wouldn’t seem to me to be a good wet chemical reagent for anything. But back to the atmosphere where the July 1 2008 abundance of NF3 was reliably put at 0.454ppt That’s a dry-air mole fraction for those interested. See they have to ignore the water vapor, even though it is typically one percent of the atmosphere. Well I’ll stick with the dry air, but not forget the water. Now I’ve been involved in some high purity chemicals (by the multikilograms) I used to work in a building containing enough Arsenic to poison every living thing (that doesn’t love the stuff) in the known universe; and that stuff was good stuff; seven nines purity; that’s 99.99999 % pure Arsenic, and we had around the same amount of seven nines pure Gallium; the French quicksilver. It had to be that clean to let us grow good infra red Gallium Arsenide single crystals to make IR photodiodes, or use as substrates to make red GaAsP LED epitaxial material (ancient technology now). So if NF3 were the ONLY atmospheric GHG, the air would be 99.9999999999546 pure. That air is 200,000 times more pure, than the very best semiconductor raw materials we were ever able to get out hands on. Well maybe you can get eight nines pure stuff these days. I’m still inshock wondering why the GWPs are not based on per molecule comparisons; so it will take me some time to recover my senses, and figure out what that really is. So just what does this potency mean; and does anybody know what modes of resonance oscillations are active in the 40-240 meV range in Nitrogen Trifluoride. The molecule looks supsiciously like ammonia which is tetrahedral, and it is well known that ammonia has a resonance where the nitrogen atom, pops up and down through the middle of the plane of hydrogen atoms, to invert the tetrahedron; and it does that at a microwave frequency that was used as the basis of the first practical Atomic clock. Given that NF3 is 17.000 times more potent per century per kilogram at levels 200,000 times more pure than the best semiconductor high purity chemicals; you would think that the President of The United States would have decreed a National emergency, and instructed every Government or Government funded R&D agency or lab to divert their entire budgets to determining that molecular absorption spectrum of NF3, and determining the capture crossections over the infrared range from 40-240 meV; maybe over the solar spectrum as well. Sounds like panic time to me. I have the paper from the chap at Scripps, mentioned in the article, but drew a blank form the chief hoincho there on the spectrum; ho hum, maybe someone will get around to looking at this new devil gas. Care to tell us what materials are used to make Nanosolar’s panels? Link gave me an error Anne. But good luck on that “cheap” thing there. Cheap for whom; certainly not the taxpayers who pay for the government subsidies for these “Cheap” solar panels. Why is it Anne, that none of the solar panel manufactureres ever talk about their efficiency; a number that will vary throughout the day, as the solar spectrum at the surface changes form sun up to sun down. How about efficiency in terms of how long does a modern production solar panel have to run, generating electricity, to recover all the energy that went into all the materials from their raw state till the panel was installed and making free electricity to the grid. And how does that energy capital time compare to the mean time to failure of a modern solar panel ? Well just asking; it would be nice to know if we gain energy or lose energy in this transaction. NASA may be able to afford the cost of “cheap” triple junction solar cells that may get 30% efficiency, because weight to them is gold in the bank; but down to earth real actual energy users can’t afford such things. I’ve heard of solar cells that you can paint onto a sheet of mild steel, with a paint roller; dirt cheap so they say; but they don’t often say, how much solar electricity they can make during an average day in an average location. Let’s all get ready for the next bubble to burst; the solar and renewable green energy bubble. My IRA, and 401K investment managers, have specific instructions to not invest one brass razoo of my hard earned retirement funds on anything that even smells or sounds like renewable green energy or hydrogen or any other scotch mist program. I’ll trade that information for the recipe of Coca Cola. Cheap for whom; certainly not the taxpayers who pay for the government subsidies for these “Cheap” solar panels. Yep, there’s subsidy going in there too. My superficial research indicated it is $ 25 m on a total private funding of $ 500 m. So there are some capitalists putting large amounts of money in that company. I wonder why. They’re probably stupid. Why is it Anne, that none of the solar panel manufacturers ever talk about their efficiency; a number that will vary throughout the day, as the solar spectrum at the surface changes form sun up to sun down. I am stunned by this remark. All manufacturers publish the efficiency of their panels. And it can be verified very easily. Solar panels are expensive things, bought by people measuring every watt hour coming out. Any panel not meeting the specs will be promptly returned with a complaint. The total amount of energy produced from a solar panel in Germany (~50 degrees latitude) is 800 Wh per year per watt peak. So a 200W solar panel will produce around 160 kWh per year when pointing south at an inclination of 30 degrees. The best commercially available solar panels have an efficiency of a little over 20%. Efficiency by the way is not a very important measure, price per watt peak is the most important one. Nanosolar claims its panels are 14% efficient. Somewhere between 1 and 4 years, depending on type and location. href=”http://jupiter.clarion.edu/~jpearce/Papers/netenergy.pdf”>Here is a paper. Google for ‘energy payback solar panels’ to find more information. You bet there will be a bubble and you bet it will burst. Did the the dot com bubble prove the internet was not such a good idea? A stupid question deserves a stupid answer, sorry. Nanosolar is understandably very protective of their intellectual property. So nobody on earth apart from a small group of researchers could answer your question. Of course have no clue, why should I? I can predict that the next generation of Intel CPU’s will be at least twice as fast as the current one, without having a clue how they pull it off. Does that make me a believer too? If investors are prepared to put $ 500 million in this company, then as a believer, I am in good company. There’s only about 18000 hits. Note that I asked you what the panels are made of, not the blueprint for their factory and their recipes and operating procedures. Since you think NF3 is “nasty”, I’m just wondering what you think of the “S” in CIGS.